Bill Gates, John Grisham, James Michener, E. O. Wilson, Ernst Mayr, George Lucas, James Cameron, Larry King, Ian Wilmut, Jane Goodall, Stephen Jay Gould, Tim D. White, Leon Lederman, Timothy Berners-Lee and Bill Gates. Complete and more interview go to websites “www.achievement.org”. Mais entrevistas e completas no site “www.achievement.org”. My relatives live 3 miles from Spring Hill, Tennessee. When the new General Motors plant opened there I got to go see it. What if I had said, “The assembly line created a beautiful Saturn automobile!” Hopefully, some would have corected me by responding, “The assembly line did not create the automobile. It was first designed by the General Motors engineers in Detroit.” ASSUMING EVOLUTION IS TRUE, IT WOULD STILL ONLY BE THE MECHANISM. DOES EVOLUTION ACCOUNT FOR THE DESIGNER? With the passing in recent years of the three most revered scientific spokesmen for evolution—Isaac Asimov, Carl Sagan, and now Stephen Jay Gould—Professor Ernst Mayr is left as the unquestioned dean of the modern evolutionary establishment. Gould, Asimov, and Sagan were all three extremely prolific and brilliant writers. All three were atheistic professors at prestigious eastern universities (Gould at Harvard, Asimov at Boston University, Sagan at Cornell), and all three were effusive and vigorous anti-creationists. They were formidable opponents (but eminently quotable), and we miss them. All three died at relatively young ages. But that leaves Ernst Mayr, long-time professor of biology at Harvard. 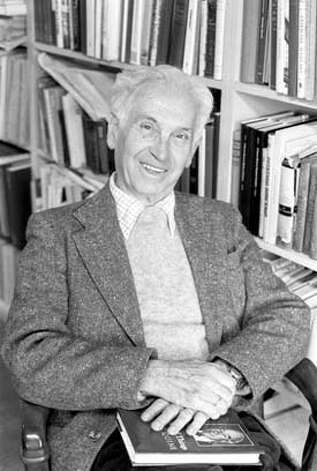 Dr. Mayr was born in 1904 and is (at this writing) still very much alive, and nearing the century mark. Dr. Gould recently called him “the greatest living evolutionary biologist and a writer of extraordinary insight and clarity” (in a jacket blurb on Mayr’s latest book). And that book is the subject of this article. Its title is intriguing—What Evolution Is (Basic Books, 2001, 318 pages),—for if anyone could speak authoritatively on such a subject, it should be Professor Mayr. In his adulatory foreword, Jared Diamond, another leading modern evolutionist, concludes: “There is no better book on evolution. There will never be another book like it” (p. xii). It is now actually misleading to refer to evolution as a theory, considering the massive evidence that has been discovered over the last 140 years documenting its existence. Evolution is no longer a theory, it is simply a fact (p. 275). He dismissed the evidence for creation as unworthy of further discussion. “The claims of the creationists” he says, “have been refuted so frequently and so thoroughly that there is no need to cover this subject once more” (p. 269). He himself, however, has apparently not bothered to read any creationist or secular anti-evolutionist scientific books or articles. Or at least that is what one would infer from the fact that none of them or their arguments and evidence are even mentioned in his book. No mention is made by Mayr, for example, of creationist expositions of the amazing created designs in living systems, nor of the effects of God’s curse on the creation, or of the significance of the great flood in understanding the geologic record. He does not even acknowledge the significance of naturalistic catastrophism or of such scientific concepts as complexity or probability. Current ideas about “intelligent design” are never mentioned. The origins of all things are due to time, chance, and natural selection, no matter how complex and interdependent they may be, according to Professor Mayr, who had been (along with Julian Huxley, George Simpson, and a few others) primarily responsible for the so-called modern evolutionary synthesis (or neo-Darwinism) back in the 1930s and 1940s. Neither does Mayr seem aware that there are now thousands of credentialed and knowledgeable scientists (including a great many biologists) who reject evolution, giving not even a nod to the Creation Research Society, or to ICR, or any other creationist organization. He does occasionally refer to God or to Christianity, but only in passing, and always in a context that indicates that he does not believe in either one. He, like his three younger colleagues, is an atheist, and this naturally constrains him to ignore any possible theological implications of the origins issues. Mayr’s new book is beautifully written and does contain much good material, but it will not convert many to evolutionism, even though he does devote a chapter to what he thinks are the evidences for evolution. These evidences are essentially the same as those used 140 years ago by Darwin in the Origin (fossils, comparative morphology, embryological similarities and recapitulation, vestigial structures, and geographical distribution). Mayr adds nothing new to these arguments, ignoring the fact that creationists (and even a number of evolutionists) have long since refuted all of them. He does devote a brief section to the more recent “evidence” from molecular biology. But that also has been vigorously disputed by a number of specialists in this field, especially the supposed evolutionary relationships implied by the molecules. Even Mayr admits that “molecular clocks are not nearly as constant as often believed” (p. 37), but he does not mention any of the numerous contradictory relationships implied by these biochemical studies (e.g., the well-known genomic similarities of humans and bananas). As do most evolutionists, Mayr spends much time in discussing micro-evolution, whereas modern creationists only reject macroevolution. He devotes five chapters to microevolution and only one to macroevolution. This particular chapter is quite long, discussing many speculative theories about how macroevolutionary changes might be produced, but there is one vital deficiency. He gives no example of any macroevolutionary change known to have happened. In other words, macroevolution seems never to have occurred within the several thousand years of recorded history. Thus, real evolution (as distinct from variation, recombination, hybridization, and other such “horizontal” changes) does not happen at present. Where, we would ask Professor Mayr, are there any living forms in the process of evolutionary change? He gives no examples, of course, because there are none. Wherever we look at the living biota, . . . discontinuities are overwhelmingly frequent. . . . The discontinuities are even more striking in the fossil record. New species usually appear in the fossil record suddenly, not connected with their ancestors by a series of intermediates (p. 189). Professor Mayr still says that the fossils are “the most convincing evidence for the occurrence of evolution” (p. 13). Yet he also says that “the fossil record remains woefully inadequate” (p. 69). Thus, as creationists have often pointed out, there is no real evidence of either present or past evolution. We have repeatedly noted also that the scientific reason why this is so is because real evolution to any higher level of complexity is impossible by the law of entropy, which states the proven fact that every system of any kind “tends” to go toward lower complexity, unless constrained otherwise by some pre-designed external program and mechanism. Actually there is no conflict, because the law of entropy is valid only for closed systems, whereas the evolution of a species of organisms takes place in an open system in which organisms can reduce entropy at the expense of the environment and the sun supplies a continuing input of energy (p. 8). And that’s all he says about one of the key arguments against evolution. This ubiquitous dodge of the evolutionists has been discredited again and again by creationists, and one would think that this “greatest living evolutionary biologist” in this “best book on evolution” would at least take notice of our arguments! At least half of America’s population, according to many polls, are creationists, apparently agreeing more with us than with Mayr. An open system and external energy are, indeed, necessary conditions for a system to grow in complexity, but most definitely are not sufficient conditions. The question is just how does the sun’s energy produce complexity in an open system? The fact is that the application of external heat energy to an open system (such as from the sun to the earth) will increase the entropy (that is, decrease the organized complexity) in any open system, if that’s all there is. This is a basic principle of thermodynamics, and neither Mayr nor any other evolutionist has answered this problem. Evolution seems to be impossible by the known laws of science. Professor Mayr does not deal with the theological or Biblical evidences, of course. For those who believe in God and the Bible, on the other hand, creation—not evolution—is, to appropriate Mayr’s words, “simply a fact.” Evolution is merely a belief held by many who “willingly are ignorant” (II Peter 3:5) of the strong evidences and arguments for creation, and who don’t even bother to consider them. In the words of the apostle Paul: “Where is the disputer of this world? hath not God made foolish the wisdom of this world?” (I Corinthians 1:20). 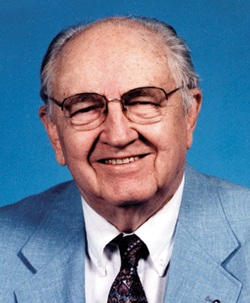 Cite this article: Henry Morris, Ph.D. 2002. The Dean of Evolution – A Review of Ernst Mayr’s Latest Book. Acts & Facts. 31 (8).